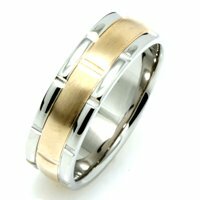 Select men's and women's classic wedding rings in white or yellow gold. Shop our collection of platinum wedding rings in timeless classic styles. Our classic wedding bands infuse traditional motifs and modern day styling. 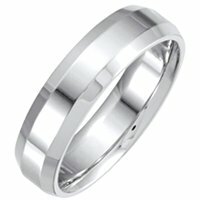 This perfect mix creates wedding rings that are not only elegant but will also endure the test of time. Their durability can last everyday wear and still be just as beautiful as the day you bought it. The Ancient Egyptians, when they believed the ring finger contained the vein that lead to the heart, started wearing rings around the finger to symbolize eternal love. The tradition continued as a gold wedding band in western civilization around the 13th. 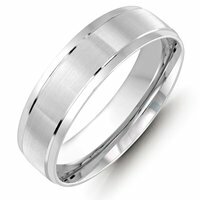 Whether carved or two toned, our classic wedding bands are so masterfully manufactured that we stand by the quality 100% with a lifetime warranty against manufacturing defects of any kind. 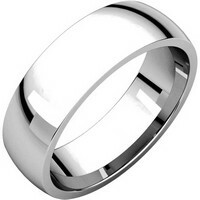 Our classic wedding bands all come in comfort fit for the most comfortable wear. As with all our products, we've taken decades to master manufacturing our wedding rings with distinct high quality metals. 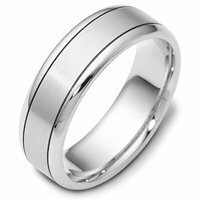 Every wedding ring purchased from our site is completely solid and never hallow using 14kt and 18kt gold, platinum, or palladium.